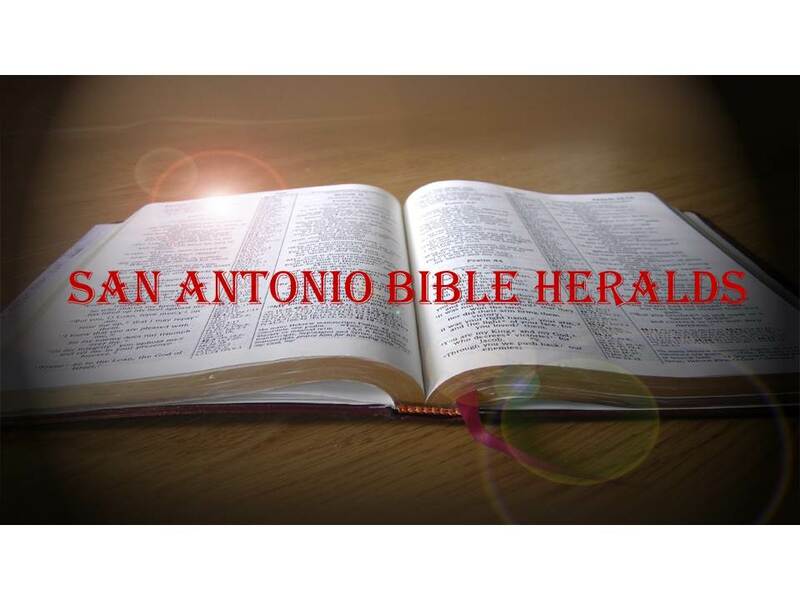 San Antonio Bible Heralds: Does Rome Have the Gospel? And this where Rome comes in. How? Because as Christians become a persecuted minority, they will begin to look around for people of seemingly like mind. It is natural. When men are in trouble they naturally begin to seek to huddle with people they consider as having the same ideas and purposes that they do. Unfortunately, when they do that they often fail to have the discernment necessary to know truth from error. You can see it every day in ever increasing measure. How many evangelical preachers and churches have you seen in the last two decades who are unrecognizable to the way they began? When you have people within so-called Christian churches who can hold positions of leadership and go as far as to deny that Jesus is the second person of the Trinity, you have reached the point of combustion. And that is exactly what the church in general is doing to itself: self-combusting. In our rush to find people with whom we can commiserate as we are increasingly marginalized and insulted, we may be tempted to rush to embrace people who, though well intentioned and sincere, are nevertheless in the throes of error. If there is one thing that nature and the Scriptures teach us, however, is that light and darkness cannot coexist. In 2 Corinthians 6, Paul warns the Corinthians sternly about associating with evil. And the reason for such warnings is simple. For a people who were in the midst of incredible immorality and sinfulness, it was essential that they keep themselves from such filth. The society of the Corinth of the first century was steeped in sin and perversion. Today, we find ourselves in a similar situation. Our society, once reverent of morality and the Bible, is now outright hostile to such matters. The morality of our age is “what you think is good for you is okay with me.” Very few are willing to stand and call sin for what it is. And if we are willing to compromise the truth of the gospel in order to find solace and comfort in numbers, we will fall prey to that insidious influence. But what is wrong with Rome? After all, they claim to believe in Christ. They are Trinitarian and believe that Jesus died for our sins. Or so we are told. The problem is not that Rome seemingly has all the right doctrines in the right places. The problem is that Rome has added a legion of beliefs and practices that are foreign to the word of God and that were unknown to the apostles and other Christians, in some cases for centuries. The apostle Paul warned the Galatians about a different gospel in the first chapter of his letter to that church. The Galatians were being hounded by Judaizers who taught that, in order for anyone to be saved they had to be circumcised. You may wonder why that was so important. Just for one reason: Paul emphasizes again and again that to add anything to the gospel of Christ was to invalidate it. Near the end of the letter in chapter 5, he tells the Galatians that if they are now seeking to be justified by circumcision, they have fallen away from grace. In other words, they are now trusting themselves rather than the grace of God. And that was adding just one thing to the gospel. With Rome, we have hundreds. It would take a book to list all the things that the Catholic Church has added to the gospel that are completely foreign to it. It has taken that church nearly twenty centuries to develop all the innovations it has. It would be impossible to name them all in such a short article. They include prayers and veneration of saints, the prayer of the rosary, indulgences, purgatory, etc. Doubtless there are legions of books that discuss all of these. But we can name a couple of the more egregious ones that lead, not to God and to the salvation that can be found in Christ, but to a system of works salvation that not only does not save, but does not lead to the peace that Paul spoke of in Romans 5:1. Take the sacerdotal system that Rome has develop and which serves as perhaps the cornerstone of the whole system. According to Richard Hansen, the priesthood was completely unknown before the third century. As a matter of fact, according to Hansen, the system developed primarily because those who were its earliest proponents were ignorant of the teachings that are contained in the book of Hebrews. According to the letter to the Hebrews, Christ is the only priest of the Christian church. Jesus, Hebrews tells us, is the High Priest of our profession who offered himself once and for all as an eternal sacrifice which provided all we need for our salvation. In contravention to the Scriptures, however, the Catholic priest through the so-called doctrine of transubstantiation, transforms the emblems of the Lord’s Supper into his literal body and blood. This is done, according to Catholic theology, in order to sacrifice Jesus during the “Sacrifice of the Mass.” Thus, the Catholic system has a Christ which, contrary to the clear teaching of Hebrews, offers himself repeatedly and all without being able to bring peace to the worshipper. No other doctrine, however, is as pernicious as the obsession Rome has with Mary. The Catholic Church has built an entire system around the worship, service and adoration of Mary that rivals that of any Christian for Christ. The Mariolatry that Rome engages in is truly breathless and keeps any faithful, knowledgeable Catholic from the true gospel. There are a myriad of doctrines built around Mary, but some of the more salient are the immaculate conception, the idea that Mary was conceived without original sin so as to preserve her sinlesness and thus become a vessel without blemish through which to bring Christ into the world; the bodily assumption of Mary, which teaches that Mary did not corrupt in the grave, but that her body was taken up into heaven before that happened and is now the “Queen of Heaven”; and the perpetual virginity of Mary, which, as the description implies, is the idea that Mary remained a virgin throughout her life. This last doctrine began to make inroads into the church at a time when asceticism became more and more common among Christians in the late 2nd and early 3rd centuries. And finally, there is the issue of the Scriptures and the place they hold in Catholic theology. According to Rome, the Scriptures are not a sufficient source for faith and practice. Rather, the traditions of the church are said to hold as much authority as the Scriptures when it comes to the dogmas of the church. Ironically enough, however, Rome’s apologists are always seeking to justify its practices by appealing to the Scriptures to provide initial authority for its traditions. Take for example the existence of traditions themselves. They often appeal to such references as John 20:30 where John tells his readers that "many other signs did Jesus in the presence of his disciples that are not written in this book..." However, they forget the last part of that passage where John says "but these are written that you may believe that Jesus is the Christ the Son of God and that believing you may have life in His name." Thus, John tells us that believing what is written is enough to gain life. No need to go further than what is written as Paul reminds the Corinthians in 1 Corinthians 4:6. When you add to the Scriptures, whether by new written revelation or tradition, you will soon find yourself adding doctrines and beliefs that have nothing to do with the true gospel. That, it is self-evident, is what has happened with Rome. Can a practicing Roman Catholic be a true Christian? I don’t know. I leave that to God to determine. However, anyone who embraces the doctrines of the Catholic church and who believes that his efforts will form part of being accepted by God is very much misunderstanding what the true gospel is. Anyone who understands what the truth of the gospel is, cannot in good conscience be a practicing Catholic. The two cannot possibly mix in light of what Rome has determined are issues of dei fide, of the faith. 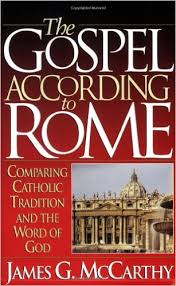 So if you are caught in the treadmill of works and sacraments that is Rome, I urge you to learn the truth of the gospel, that justification is by faith because of the grace of God and not through our own efforts. You too can have peace with God if only you will receive it.